Guildford's High Street, which runs steeply down to the River Wey, has maintained its mellow Georgian character over the centuries. Though the frontages are mostly Georgian, several conceal older buildings behind. The most impressive of these is the Guildhall, which has a 17th century facade added to a Tudor building. Other buildings on the High Street worth visiting are Guildford House, the Abbot's Hospital and The Royal Grammar School. Founded in 1507 and endowed by Edward VI in 1552, which contains a notable chained library. 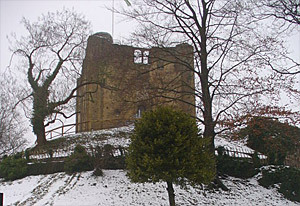 Just a short distance from the High Street is the ruins of Guildford Castle, set in beautiful gardens. Guildford's most imposing building is its cathedral, which occupies a commanding position on Stag Hill. 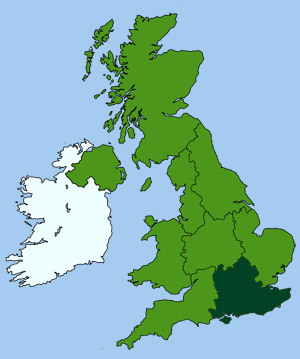 The University of Surrey occupies two sites, one on Stag Hill near the cathedral and the other north-west of the town. The River Wey, which runs through the centre of the city, was once a commercial waterway with locks built circa 1653, but now only used by pleasure craft. An 17th century tread-wheel crane, used to load and unload barges on the river, once stood close to the town bridge. It is now displayed on the wharf at Millbrook. Lewis Carroll, author of Alice In WonderLand, acquired a house in Guildford in 1868 as a home for his sisters. He was a regular visitor, and he died here in 1898. The Guildford Museum has a section devoted to him. Carroll's house (not open to the public) is not far from the middle of town on Castle Hill. Just west of Guildford, the A31 runs along a high ridge called the Hog's Back, providing fine views on either side. Lewis Carroll is said to have been walking along the Hog's Back when he thought of the celebrated line: For the Snark was a Boojum, you see, the initial inspiration for the poem "The Hunting of the Snark". The castle started out as a simple Norman motte and bailey. Henry II later replaced the wooden defences with stone during the 12th century. As the only royal castle in Surrey it soon became the centre for administration and justice, and its keep was used as the county gaol. Under Henry III it became one of the most luxurious royal residences in England but after his death it quickly fell into decline. Today its surroundings have been transformed into a beautifully landscaped park. Its bleak ruins standing on a high mound, that provides excellent views across the surrey countryside. There is a shop and a small exhibition in the base of the tower. Also known as the Hospital of the Blessed Trinity. Built in 1619 by George Abbot, Archbishop of Canterbury, as an almshouse for old people and is still in use today. Parts of the building are open to the public. A clock bearing the date 1683 projects over the street from the front of the Guildhall, however the building itself is much older, dating back to 16th century. The classical frontage has an elegant balcony, tall windows and a hexagonal bell-turret. The building was once used as a courtroom and council chamber. A set of standard measures, presented to the town by Elizabeth I, are preserved in the old courtroom - one of a few complete sets still in existence. Permanent exhibitions include archaeology and local history, a specialist needlework collection plus a large collection of John Russell paintings. The museum also has a collection of items connected with and Gertrude Jekyll and Charles Lutwidge Dodgson (Lewis Carroll), the author of Alice in Wonderland, who passed away in Guildford in 1898 and is buried in Mount Cemetery. Guildford House, built in 1660 for John Child who was three times Mayor of Guildford. It is now the town's art gallery. Displays include artwork from the Borough's Collection and varied temporary exhibitions. One of only two Anglican cathedrals to be built in Britain since the Reformation (the other is at Liverpool). 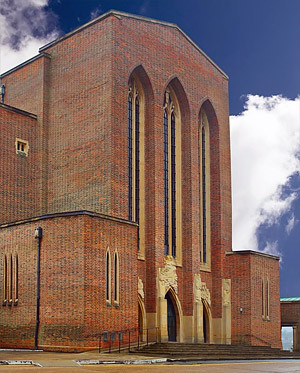 Designed by Sir Edward Maufe in a simplified Gothic style, with a red-brick exterior. Building started in 1936, but the Second World War delayed progress, so the cathedral was not consecrated until 1961. The Civic Hall seats over 1000 guests for concerts, and is home to the Guildford Philharmonic Orchestra. Theatrical entertainment is also provided at the Yvonne Arnaud Theatre, opened in 1965 and named after the actress and concert pianist who died in 1958. The venue is pleasantly situated on the river bank, a short distance from the Town Bridge.